Multi-media artist Meridel Rubenstein opens a solo exhibition of new work at Brian Gross Fine Art on Thursday, September 6, with a reception for the artist from 5:30 - 7:30 pm. Rubenstein’s work over the past ten years has been in the vanguard of technical innovation in photo-based media. Her newest multi-media installation, the second part of Joan’s Arc/Vietnam, combines photography and sculpture to explore issues of history, myth, war, displacement and home. Throughout her 25 year career, this internationally acclaimed artist has explored political, mythical, historical, and spiritual themes in photography and multi-media work focusing on distinct narrative images. By presenting the image of warrior-martyr Joan of Arc along side stills of montaged video footage from her trips to Vietnam, the first part of Rubenstein’s Joan’s Arc / Vietnamportrayed the impact of the Vietnam war from Eastern and Western points of view. 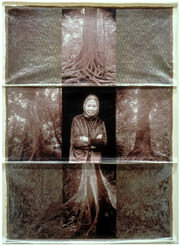 Continuing this series, her current body of work, Millennial Forest,alternates images of ancient trees and people from both the US and South East Asia, showing the two cultures as persevering through the consequences of war, history and religion and entering a zone of communality. On view at Brian Gross will be a visually compelling installation of large photographic prints of trees along with a sculpture from the artist’s Trees at Sea series, which incorporates a 19th century dugout boat and glass laminated portraits of Vietnamese and Americans whose lives have been irrevocably changed by the Vietnam war. Her uniquely executed photographic prints have a timeless, spiritual quality. Their shimmering, luminous surface is achieved by artist-rendered color transferred onto tree bark paper, which has been coated with multiple layers of ground mica and gum arabic. Born in 1948, Rubenstein received an MA and MFA from the University of New Mexico, Albuquerque. She currently is the Harnish Visiting Artist at Smith College in Northampton, Massachusetts. Meridel Rubenstein has received support for her work from the National Millennium Survey, the National Endowment for the Arts, the Pollock Krasner Foundation, the Guggenheim Foundation and the Bunting Institute at Harvard/Radcliffe College, Boston. Her work has been the focus of numerous gallery and museum exhibitions throughout the United States, including Site Santa Fe, the Museum of Contemporary Photography, Chicago, the Museum of Fine Arts, Santa Fe, the Center for Creative Photography, Tucson, The List Center for Visual Arts, MIT, Boston, the National Museum of American Art, Washington, DC, the Museum of Fine Arts, Houston, the Friends of Photography at the Ansel Adams Center for the Arts, and the San Francisco Museum of Modern Art, San Francisco. She currently maintains studios in New Mexico and Vermont.